The record breaking 2018 Magic Millions National Weanlign Sale this week produced outstanding results for our outstanding young sire Zoustar, soon to be crowned Australia’s Champion First Season Sire of 2017/2018. 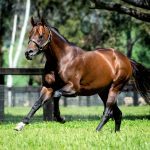 Zoustar had 15 weanlings sell at an average $161,667, putting him third on the leading sires by average list behind only Fastnet Rock and Pierro. His top seller was a cracking colt from imported stakes-winner Shakeira (USA) offered by Kingstar Farm that made $310,000 to the bid of UK based investors Redwall Bloodstock. 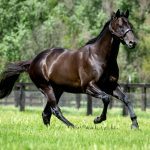 “He’s obviously by the most exciting young sire over here at the moment,” said David Redvers, who also manages Qatar Bloodstock, which share in the ownership of Zoustar. “We have a vested interest I must say, but he’s just a cracker. Shakeira was bought from the Widden draft at the Magic Millions Broodmare Sale last year by Kingstar Fam for $90,000, so they’ve had a great result! 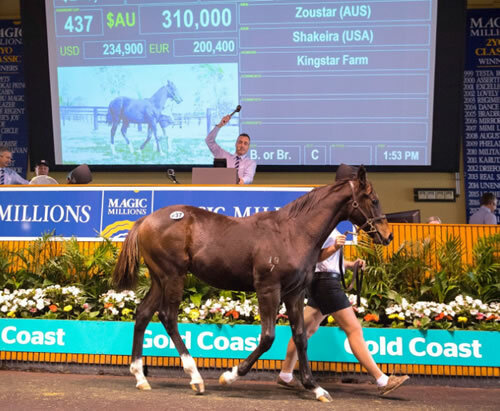 Other good sales for Zoustar were a colt from She’s All Greek that made $260,000 when snapped up by renowned pinhookers Musk Creek Farm, a filly from Special Fragrance that made $230,000 when secured by Redwall Bloodstock and a colt from Saffie Darling that made $230,000 when bought by Maluka Thoroughbreds/ Milawa Park.